Small Sister is a unique strategy game developed by Proximity Games. 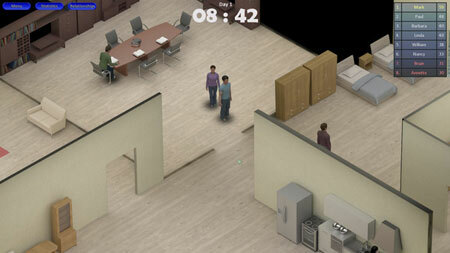 It is a game about a contest: living in a house with strangers. Your goal is to gain as many points as you can by interacting with other contestants and to be the winner at the end. You must gain enough points in order to avoid being on the last two place on the points table. Your interactions are limited, so think carefully and plan your strategy based on the skills you’ve chosen. The winner of the day gets the right to send one of the last two contestants. If you are willing to shape the community, your aim must be to win each day. Every single interaction has a consequence and the time is limited. Every single interaction changes your situation. Some choices lead you irreparable and bad consequences. Some choices lead you amazing consequences. There are 4 types of skills, each of them is unique. If you get stuck in the game, check out the video walkthrough and gameplay for the game. This entry was posted in PC and tagged Small Sister Cheats, Small Sister Gameplay, Small Sister Guide, Small Sister Strategy, Small Sister Walkthrough by Marvin Tang. Bookmark the permalink. Copyright © 2019 9Puz Gaming News. All Rights Reserved.